Colin Farrell is back in another sure-to-be-very-good film that will probably not do so well at the box office, the upcoming revenge thriller Dead Man Down, directed by Niels Arden Oplev. The first trailer for the lonnnng-awaited adaptation of On the Road is here — an international/market spot (the film doesn't yet have US distribution) showcasing Jack Kerouac's shambolic literary stylings and director Walter Salles's ensemble including leads Sam Riley, Garrett Hedlund, Kristen Stewart and a kind of staggering supporting ensemble: Viggo Mortensen? Kirsten Dunst? Amy Adams? Terrence Howard? Steve Buscemi? Elisabeth Moss? You can't Beat it! There are instances when reviewing intentions would be so much easier than reviewing actual movies, and Red Tails, which was directed by first-timer Anthony Hemingway but conceived, shaped and willed into being by George Lucas, is one of them. Red Tails is – or is intended to be – a rousing comic-book adventure based loosely on real-life events: The picture follows a group of Tuskegee Airmen as they shoot down German fighter planes and blow munitions transport trains to smithereens. In between missions, they fight more personal battles, against insidious racism and bigotry. 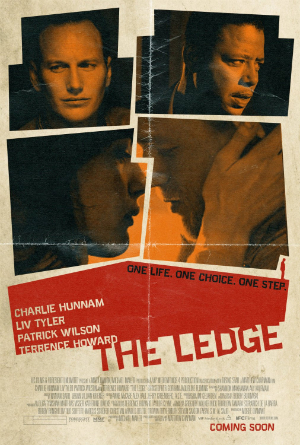 In Matthew Chapman's The Ledge, a battle of wills and of faith erupts between atheist Gavin (Charlie Hunnam) and uber-religious Joe (Patrick Wilson) after Joe discovers Gavin's been sleeping with his wife (Liv Tyler). The predicament lands Gavin on the titular ledge, forced to jump at the stroke of noon or else something terrible will happen to his lover... who's dealing with some intimidating marital overtures at home herself. Watch the Movieline exclusive (and NSFW) clip after the jump.